Recently, one of my relatives, who also started practicing container gardening on the terrace of their home, probably after getting an inspiration from my small gardening space, were at my home. They bought along with them, a few bitter gourds, which, were grown on their rooftop. Though, I don’t like the bitter gourd, due to its bitter taste, but, I was extremely overwhelmed with these fruits, and the amount of hard work and dedication that went into growing these fruits. More so, I was happy that my personal gardening space, and this blog proves to be an inspiration for atleast some one. Infact, my two bitter gourd vines are bearing fruits, but, a few of those fruits didn’t quite make it, as most of these were damaged by worms. It still has two fruits, which have grown enough to be eaten, but, then, only two fruits won’t be enough for even a single person. Anyways, I am waiting for some smaller fruits to grow, so that I could share them with you all, and my father who loves bitter gourd could relish on these home grown organic gourds. 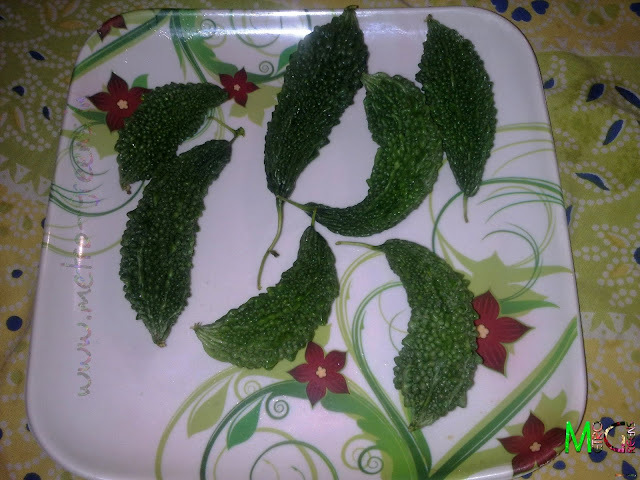 Till then, I’m sharing a few shots of the bitter gourd fruits I got from them. As of now, different vegetable vines and plants are bearing some fruits or flowers, except the beans. The pumpkin vine is having two small pumpkin fruits, you’ve already seen the bitter gourds and the chilly plants, infact, almost all but one chilly plants are bearing fruits. The ridge gourd vines too have two small fruits. I’ll keep you updated with the status of all these plants and fruits in the upcoming posts. Till then, keep visiting and HAPPY GARDENING! Thanks for your visit Anunoy. Then, my father too is a black sheep, like you :P. He also loves having the bitter gourd fried.